As a result of the unjustified beating of Paul by the Jews in the temple precinct, Paul was rescued by the commander of the Roman cohort. Orders were given for Paul to be bought into the barracks. The KJV and the NKJV use the word castle. The CEB use of military headquarters probably conveys the correct idea. (Acts 21:27-40). 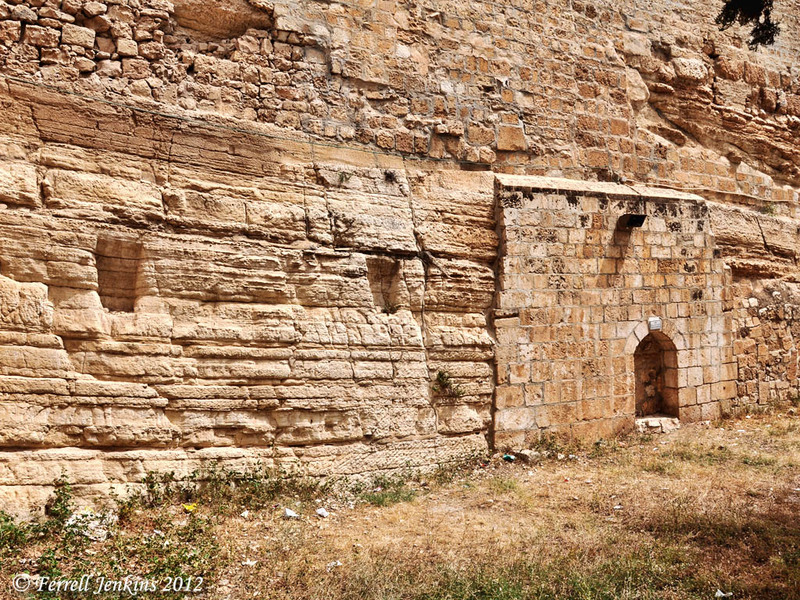 The parembole served as headquarters for the Roman troops in Jerusalem (BDAG). The building under consideration in Acts 21 is the Fortress of Antonia. The massive structure was built by Herod the Great and named in honor of Mark Anthony. Murphy-O’Connor says the fortress “both protected and controlled the Temple” (The Holy Land, 34). The temple was surrounded by the Kidron Valley on the east, the Tyropean Valley on the west, and a steep decline on the south. The area needing special protection was the northwest corner. 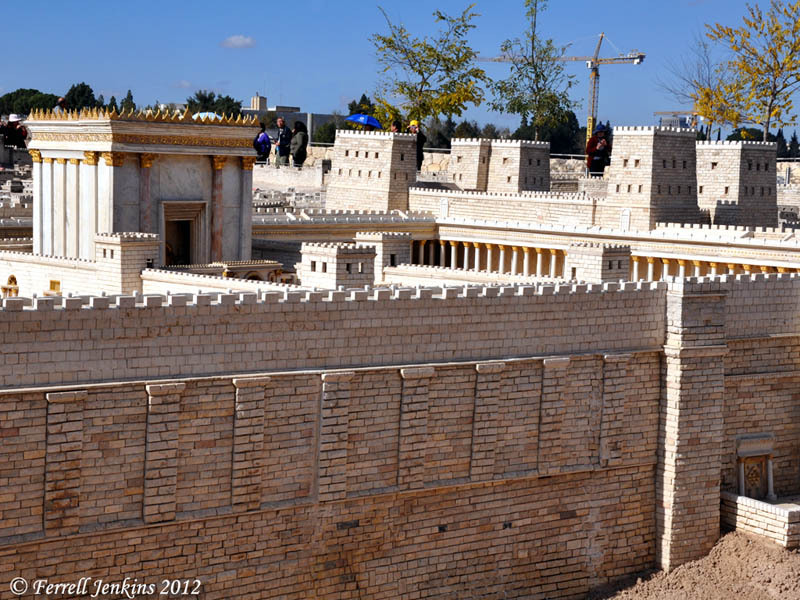 Second Temple Model, Jerusalem. The Fortress of Antonia stands on the northwest corner of the temple precinct. Photo by Ferrell Jenkins. Josephus describes the “tower of Antonia” in the Wars of the Jews. 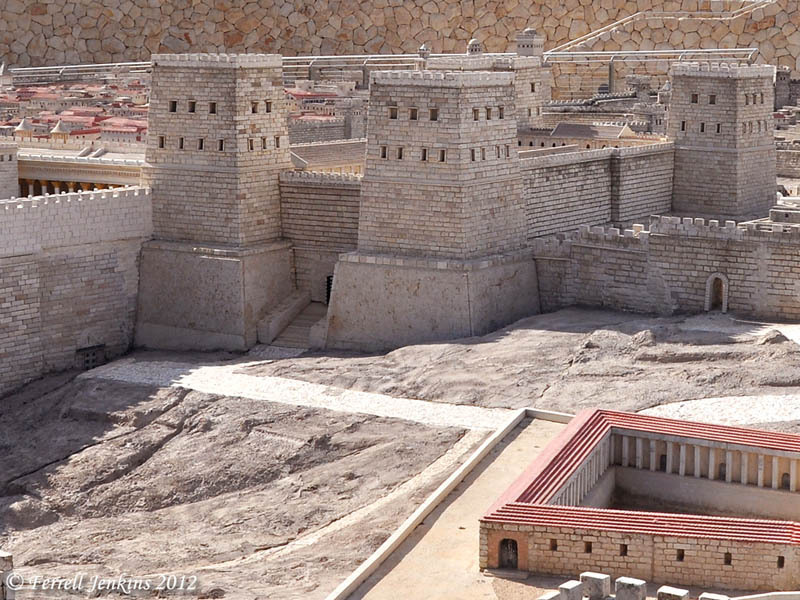 Fortress of Antonia in the Second Temple Model. Photo by Ferrell Jenkins. The photo above shows the Tower of Antonia built on the natural rock foundation at the northwest corner of the temple precinct. A portion of the Pool of Bethesda (John 5) is visible on the right. Paul’s speech recorded in Acts 22 took place on the stairs leading up from the temple platform into the fortress. When the crowd drowned out Paul, the commander ordered that he be brought into the fortress (22:24). After Paul’s nephew informed the Roman officers about a planned conspiracy to kill Paul, he was sent to Caesarea where he would remain for two years (23:23; 24:27). The photo below was made from inside the temple precinct. It shows the natural rock scarp in the northwest corner on which the Fortress of Antonia was built. See Leen Ritmeyer’s post about this, and his drawing showing the location of the steps mentioned in Acts 21. Ritmeyer sells digital images of his drawings. The natural rock scarp at the NW corner of the Temple Mount. Photo by Ferrell Jenkins. This entry was posted in Bible Places, Bible Study, Book of Acts, Israel, New Testament, Photography, Travel and tagged Apostle Paul, Military Fortress. Bookmark the permalink. Al, I am traveling and do not have a program that will allow me to mark a photo. I will do my best to do that when I return home. Ferrell, I have seen several pictures of this rock scarp, but have never figured out exactly where it is, or- more importantly – how to get there. It must be behind some building. Where exactly is it? Thanks!